The Food and Drug Administration has approved the first pacemaker to do away with electrical wires that have long been a shortcoming of internal heart devices. 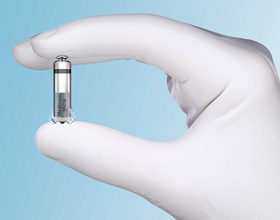 The 1-inch Micra Transcatheter Pacing System works like older pacemakers to control irregular heartbeats, but does not use leads—wires that traditionally connect the device's generator to the heart. The wires can break, wear out or become infected and are the main weakness of such pacing systems.